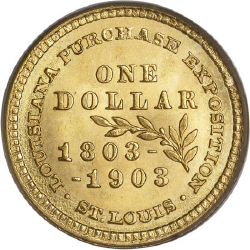 In 1903 the first United States, gold commemorative, souvenir coin was authorized by Louisiana Purchase Exposition held in 1904 to commemorate the 100th anniversary of the historical purchase of Louisiana. 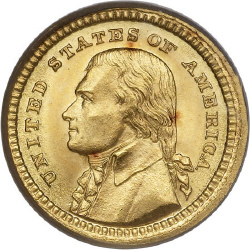 There are two varieties of the gold dollar, one with a Jefferson Bust who was president at the time of the Louisiana Purchase and a McKinley who sanctioned the exposition. 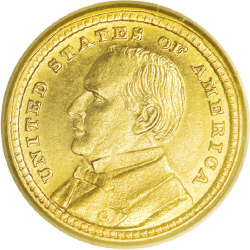 Charles E. Barber was the designer the same man more know for the U.S. Barber type coin designs. The Louisiana Purchase was the acquisition by the United States of America of 828,800 square miles of the French territory Louisiana in 1803. The U.S. $11,250,000 plus cancellation of debts worth $3,750,000, a total cost of $15,000,000 for the Louisiana territory. The Louisiana Purchase encompassed portions of 14 current U.S. states and 2 Canadian Provinces. The land purchased contained all of present-day Arkansas, Missouri, Iowa, Oklahoma, Kansas, Nebraska, parts of Minnesota that were west of the Mississippi River, most of North Dakota, nearly all of South Dakota, northeastern New Mexico, the portions of Montana, Wyoming, and Colorado east of the Continental Divide, and Louisiana west of the Mississippi River, including the city of New Orleans. (The Oklahoma Panhandle, and southwestern portions of Kansas and Louisiana were still claimed by Spain at the time of the Purchase.) In addition, the Purchase contained small portions of land that would eventually become part of the Canadian provinces of Alberta and Saskatchewan. The land included in the purchase comprises around 23% of the territory of the United States today. The purchase was a vital moment in the presidency of Thomas Jefferson. At the time, it faced domestic opposition as being possibly unconstitutional. Jefferson decided to purchase Louisiana because he felt uneasy about France and Spain having the power to block American trade access to the port of New Orleans.